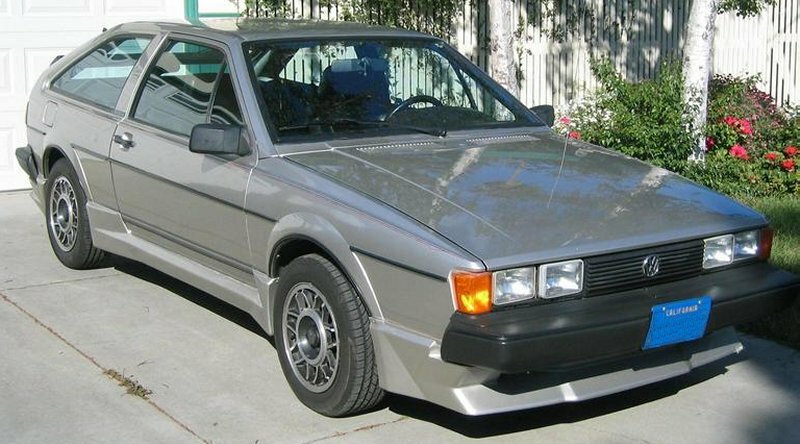 To commemorate the production of the 600,000th Scirocco in 1983, a limited run of 500 California Edition Sciroccos were built. They were also know at the factory as ‘Silver anniversary Sciroccos’. 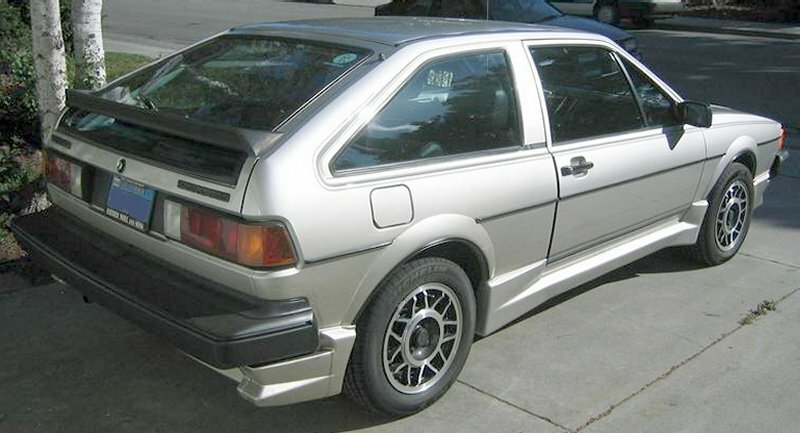 Although largely based on the Wolfsburg Edition, it was the only 8v Scirocco sold in the U.S. market to have a body kit as standard. This was essentially the same Kamei X1 kit as fitted to early European GTXs but without the raised section on the front spoiler for mounting the number plate. 14″ Avus alloy wheels, leather seats and Karmann B-pillar badges were standard equipment. The only colour choice was Zermatt silver. The sales code for this Scirocco was S44. 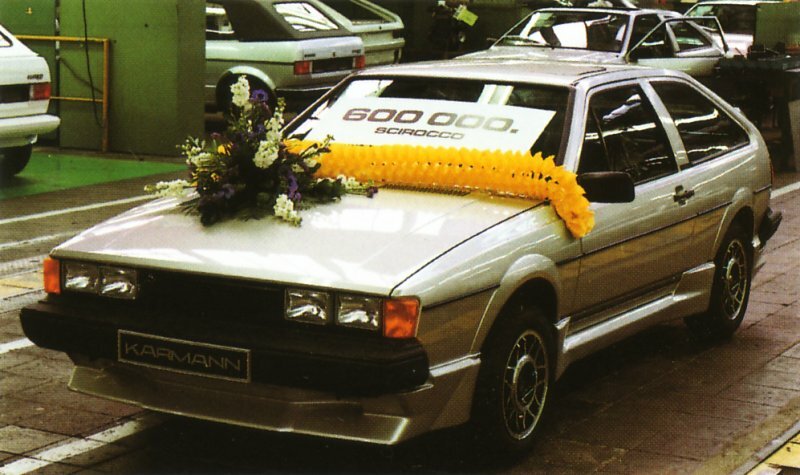 The 600,000th Scirocco leaves the Karmann plant. One of the few surviving California Editions with appropriate California license plate. The above is from a Karmann brochure. I have translated it as best I can below. If any German Scirocco fans can correct any of it, please let me know. Karmann co-workers and the 600,000th VW Scirocco, supplied to the United States. 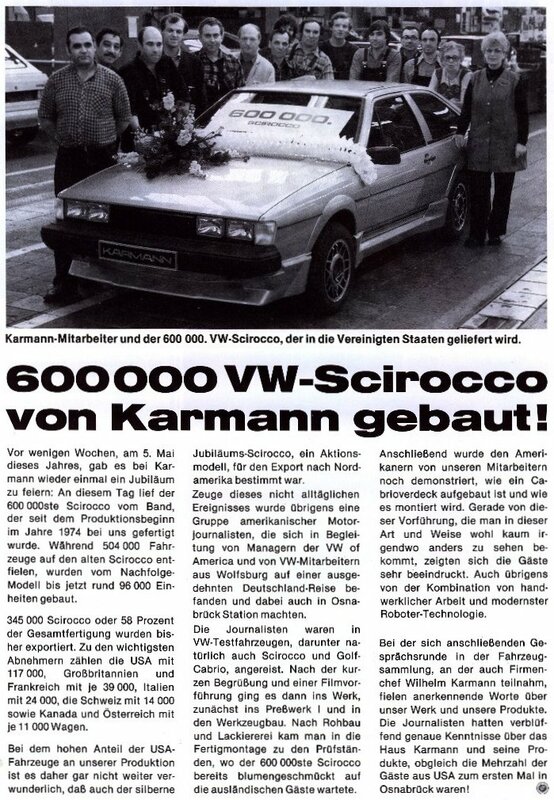 600 000 VW Sciroccos built by Karmann. A few weeks ago, on 5th May this year, Karmann once again celebrated an anniversary. 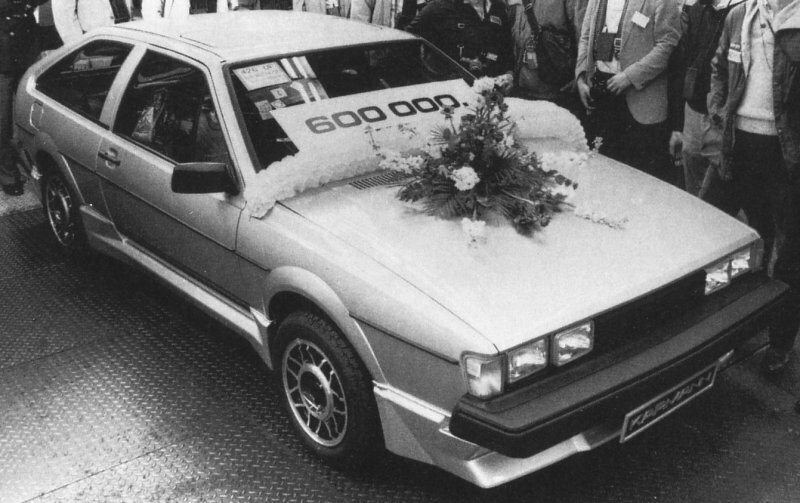 On this day the 600 000th Scirocco came off the line, it has been manufactured by us since production began in 1974. Some 504,000 units of the old Scirocco were manufactured, and approximately 96,000 units of it’s successor have been built. 345,000 Sciroccos or 58% of the total manufactured so far were exported. Among the most important customers are the USA with 117,000, Great Britain and France with 39,000 each, Italy with 24,000, Switzerland with 14,000 as well as Canada and Austria with 11,000 cars each. With USA vehicles being a high portion of the of our production, it is not at all surprising therefore that the special model ‘Silver anniversary Scirocco’ is intended for export to North America. Witness to this not everyday event came by the way of a group of American motoring journalists, who were accompanied by the managers from Volkswagen of America. The Germany journey was expanded by Volkswagen co-workers from Wolfsburg also in Osnabrück station. The journalists had traveled in Volkswagen test vehicles, naturally Sciroccos and Golf Cabriolets. After a short greeting and a film demonstration, it was then into the works. Firstly into the press work and the tool construction. Then to body-shell and paint shop and onto the finished assembly test stands, where the 600 000th Scirocco awaited already decorated with flowers for the foreign guests. Subsequently, our co-workers demonstrated to the Americans how a Cabriolet folding roof is developed and how it is installed. The guests were very impressed by this demonstration, which one hardly gets to see in this way anywhere else. Also by the way of combining work relating to crafts and the most modern robot technology. With the following round of talks in the vehicle collection, in which head of the company Wilhelm Karmann also participated, appreciative words fell over our work and our products. The journalists had astonishingly exact knowledge of the house of Karmann and its products, although the majority of the guests from the USA were in Osnabrück for the first time. Very special thanks to Rodolphe Woog for sending me scans of the Karmann brochure.